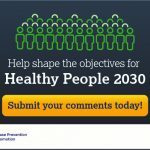 The Healthy People 2030 public comment period is now open! Review the proposed objectives, submit comments, or propose your own objective. Members of the public are invited to submit comments on the proposed objectives from December 3, 2018 to January 17, 2019. Learn more and submit your comments today!